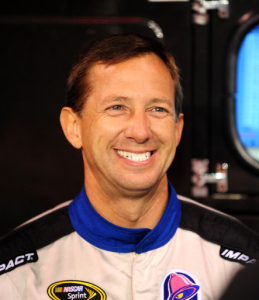 John Andretti is a native of Bethlehem, PA. John is the nephew of Mario Andretti (his father is Mario’s twin brother Aldo) and the godson of famous Indy car pilot and owner A.J. Foyt. Andretti made his Cup debut in 1993, and committed himself to NASCAR’s elite series in 1994. Andretti settled in with Petty Enterprises behind the wheel of the storied No. 43, after several runs with different owners. In 2003, he moved on to drive the No. 14 car with Dale Earnhardt Inc.